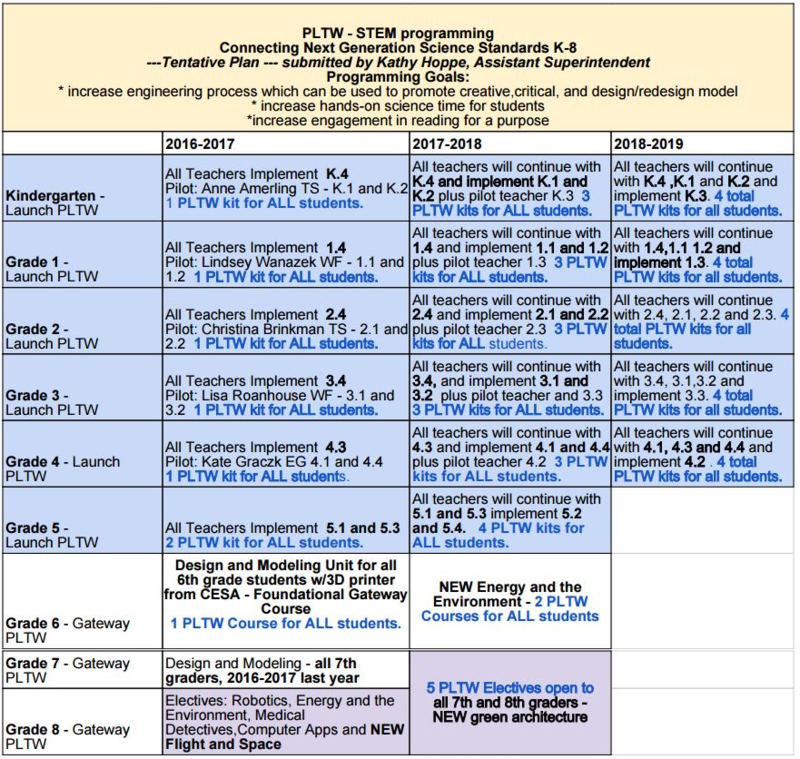 At the April 11th, 2016, Policy and Curriculum meeting the school board looked at introducing STEM & Project Lead The Way (PLTW) curriculum in grades K-5. This plan included new and additional kits in grades 6, 7, and 8 where PLTW curriculum is already in use. At the April 25th, 2016, meeting the school board approved the costs for this curriculum which totaled about $120,000 over the three years of the plan. This was the cost for staff training, the actual kits, and the consumable materials used during the activities. Below you will see the proposed implementation timeline. To learn about the PLTW kits for Grades K-5 go here. To learn about the PLTW kits for Grades 6-8 go here. The estimated annual cost for consumable materials starting in year four 2019-20) was projected to be about $25,000. You can see the three year cost breakdown and additional curriculum details by looking at the April 11, 2016 Policy and Curriculum committee meeting at the WGSD BoardDocs website. The original timeline was introduced at the February 2016 committee meeting. Below is a breakout of one of the many school board committee discussions related to STEM and PLTW. Last school year, 2015-16, the Waterford Union High School integrated PLTW into their curriculum.